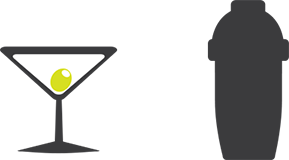 Inn Style is a reservation management system designed to help pubs with rooms create bookings, check guests in and out, and review future reservations. Kobas ‘talks’ to Inn Style using an API. This is an interface that allows different pieces of software to pass data between themselves without any need for manual input. In order to get Inn Style activated, you will first need to access Administration > Integrations > Room Booking in Cloud. 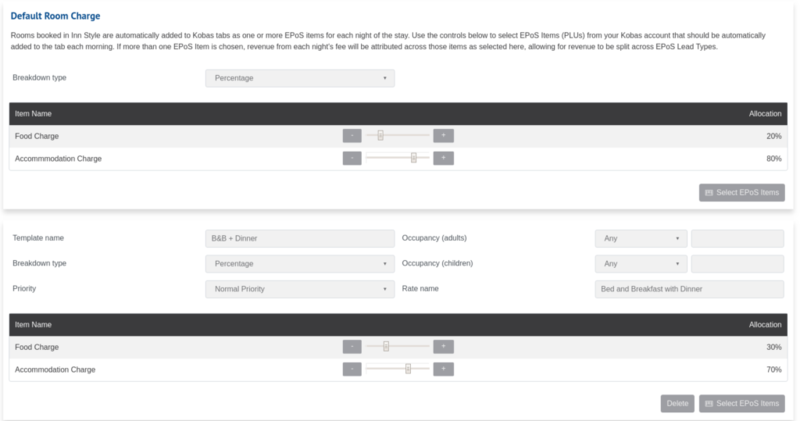 Activate the Inn Style section by ticking the checkbox and selecting EPoS items (PLUs) from your Kobas account that should be automatically added to the tab each morning. If more than one EPoS Item is chosen, revenue from each night’s fee will be attributed across those items as selected, allowing for revenue to be split across EPoS Lead Types. You can choose to allocate the fee by Percentage or Value. This will become your Default Room Charge. When done, Save. 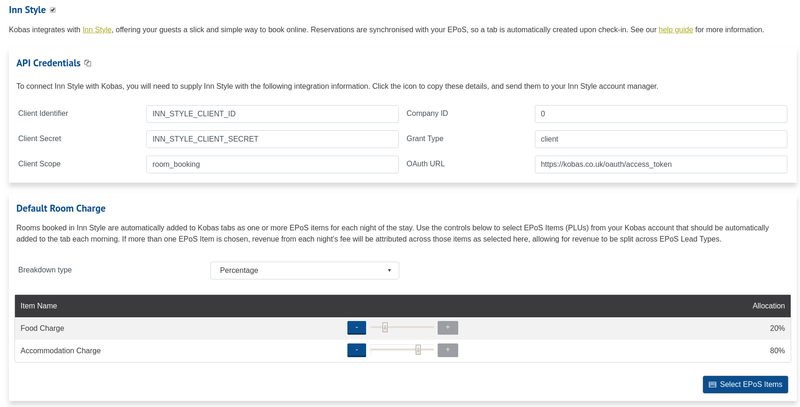 Once saved, API details will be revealed that you will need to copy and send to your Inn Style Account Manager. You can copy the details by clicking on the icon next to API Credentials. When this is done, Inn Style is ready for use. Note: If you allocate the revenue by monetary value, any excess charge of a customer’s stay will be adjusted proportionately across the selected EPoS items. While a Default Room Charge can be used for all bookings, you also have the ability to create different Room Rate options to split the revenue based on different consumption modes. 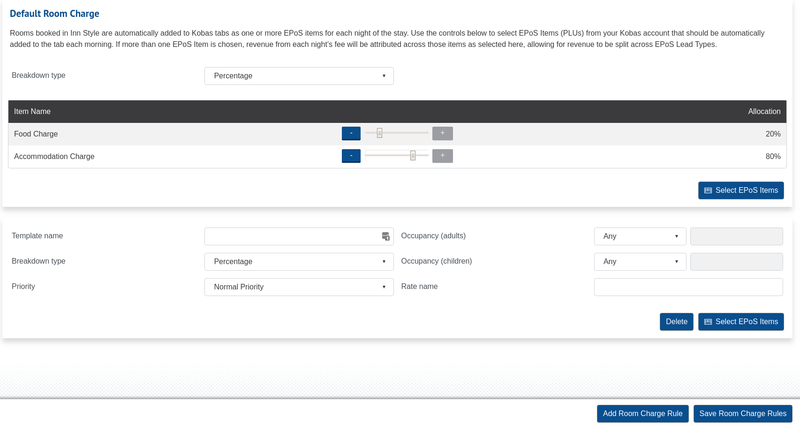 To create a new room rate type, click on Add Room Charge Rule, then, Select EPoS Items. Once you select the EPoS Items, you can use the controls to allocate the revenue either by Percentage or Value. When this is done, click Save Room Charge Rules. In the image below, a new Room Rate was created for a Bed and Breakfast and Dinner booking, with the payment allocating 30% for Food and 70% for Accommodation. If you want to add multiple Room Rates, repeat the steps. For more information about how the integration works once activated, click here.